We invite you to visit Costa Rica and enjoy our high season special packages, Costa Rica's high season for tourism runs from late November to April, which coincides with the chill of winter in the United States, Canada, and Great Britain, the main attraction of the high season is the weather very sunny and dry. If you want to spend your time relaxing on a tropical beach and a little less rain during your rainforest experience, this is the best time to visit our country. The dry season is wonderful for hiking and adventure sports. Seven vacation packages combining rain forest, cloud forest, volcanoes, beaches, adventure and a lot of fun. This itinerary takes you to some of the beautiful destinations in Costa Rica from the amazing Pacuare river rafting to the active Arenal Volcano and the hot springs, the magical Monteverde Cloud forest and Manuel Antonio National Park with white sand beaches ideal for swimming, and forest trails snake along the coast to breathtaking lookout points, this area is one of the best places in the country for viewing wildlife. Upon arrival at Juan Santamaria airport, our driver will meet and transfer you to San Jose city. Overnight at KC Colaye Hotel. Colaye San Jose combines the charm of residential San Jose with the convenience of easy access to the city center, Escazu and Juan Santamaria International airport. Located in the prestigious neighborhood of Sabana Sur, right next to La Sabana Park. We will pick you up at your hotel and head through Costa Rica's colonial capital city of Cartago before rising up through the fertile countryside that surrounds the base of Turrialba Volcano. We'll stop for a delicious breakfast along the way. Once we arrive at the verdant banks of the Pacuare River, our professional guides will instruct you on paddling techniques and safety procedures before you don your helmets, grab you paddles and climb aboard the inflatable rafts for an unforgettable adventure. The Pacuare is a swift flowing river that offers visitors a unique and exciting rafting experience within one of Costa Rica's most unspoiled wilderness areas. In fact, expert rafters call the Pacuare one of the world's best white-water runs. Once in the river, you'll battle powerful rapids and rolling waves that spill over the sides of the raft drenching everyone with excitement and fun. Lunch on the way. Continue to Arenal area. Overnight at La Pradera hotel. This hotel has amazing volcano viewa, surrounded by beautiful tropical gardens, nature lovers and birdwatchers are welcome to enjoy the natural beauty of the area. You will be enchanted by the magical murmur of the river mixed with the sound of a great variety of birds and other wild life. After breakfast you will have a free morning to enjoy the area. In the afternoon visit to Arenal Volcano National Park and Baldi Hot Springs, our hike takes you to the active side of the volcano where our naturalist guide will take you through rain forest trails for a nice and gentle hike where you can see a great diversity of flora and fauna and animals such as, monkeys, toucans, iguanas, plenty of birds and sometimes snakes. Once we arrive at the observation point we will be able to hear and feel the deep rumbling with occasional eruptions of steam, smoke and molten lava. At night if it is not too cloudy the show is even more incredible as the mammoth volcano spews red lava and huge rocks glowing against the black sky. While watching the volcano and taking pictures, our guide will share some information and history about the area and the volcano’s activity. Then we will continue our way down to the exotic and relaxing Hot Springs nearby, to sit back and relax in the volcanic water and sooth every aching muscle. Dinner. Overnight at La Pradera hotel. Breakfast. In the morning, you will travel to Monteverde by land and boat transportation crossing the Arenal Lake. Monteverde is the Costa Rica's premier cloud forest. This 26,000-acre reserve is home to an astonishing diversity of plant and animal species. Overnight at Monteverde Villa Lodge Hotel. Located in the heart of Monteverde, It's a rustic hotel with great views of the Gulf of Nicoya (Pacific) and the mountains of Monteverde. The most beautiful Mahogany wood house nicely finished with an excellent ambiance special decorated rooms. Monteverde Villa Lodge offers comfortable rooms with spacious, private bathroom with hot water. The hotel is surrounded by lovely tropical gardens and in the mornings a delicious breakfast awaits you. After breakfast, you will be taken to Selvatura walkways; this is a unique system of suspension bridges that zigzag through deep canyons at the level of the treetops and also enjoy the canopy tour adventure, then you will have free afternoon to enjoy other attractions of the area. Overnight at Monteverde Villa Lodge. Breakfast. Departure to Manuel Antonio National Park. Overnight at Playa Espadilla Cabins, located 3 blocks from the entrance to the national park and the beach. Breakfast. Free morning to enjoy the beach. In the afternoon transfer to San Jose city with the shuttle bus. Overnight at Colaye Hotel. Breakfast. Transfer to the International Airport to your flight back home. Rate in US dollars, valid just for this quotation. From the spectacular Sarapiqui rain forest and the active Arenal Volcano with the hot springs, to the beautiful Sámara beach. Discover some of the excellent wonders that Costa Rica has to offer you. Drive yourselves in the privacy of your own vehicle and at your own pace and stop when you want to take photos or explore the area. Upon arrival at Juan Santamaria airport, our driver will meet and transfer you to San Jose city. Overnight at Colaye Hotel. Colaye San Jose combines the charm of residential San Jose with the convenience of easy access to the city center, Escazu and Juan Santamaria Internationalairport. Located in the prestigious neighborhood of Sabana Sur, right next to La Sabana Park. After breakfast pick a Daihatsu Bego 4X4 up at your hotel for the followinf 07 days. Departure to Sarapiqui Area. Sarapiquí is located near to the Caribbean side of Costa Rica, a region where you can find tropical rain forests, swamps, and plantations, in a biologically rich territory, a humid land that can be explored by way of the dense network of trails within the protected areas, which are of great importance for the conservation of birds and other animal species. Overnight at Selva Verde Lodge. After breakfast you will have a free morning to explore the area. In the afternoon departure to Arenal Area. Overnight at Campo Verde hotel, Campo Verde is a small and cozy hotel located in front of the Arenal Volcano, surrounded by beautiful tropical gardens, nature lovers and birdwatchers are welcome to enjoy the natural beauty of the area. You will be enchanted by the magical murmur of the river mixed with the sound of a great variety of birds and other wild life. Breakfast. Free morning to enjoy the area, we recommend you to visit La Fortuna waterfall. In the afternoon visit to Tabacón Hot Springs where you can sooth your muscles in the clear, relaxing thermal springs. Buffet dinner included. Overnight at La Pradera hotel. After breakfast, departure to Sámara Beach. Overnight at Giada Hotel. Hotel Giada is located in Sámara beach, Guanacaste. The hotel has 24 charming rooms each with a/c, cable TV, private bath, bamboo furniture, private balcony and private bathroom wHotel Giada is located in Sámara beach, Guanacaste. The hotel has 24 charming rooms each with a/c, cable TV, private bath, bamboo furniture, private balcony and private bathroom with hot water. Everything is there for your comfortable and pleasant stay. The hotel offers breakfast restaurant and bar service, horseback riding, boat tours, snorkeling, diving, and tourist information. Breakfast. Free day to enjoy the beach. Overnight at Giada hotel. After enjoying breakfast you will have the free morning to enjoy the beach. Early in the afternoon departure to San Jose, drop the rental car off at your hotel. Overnight at KC Colaye Hotel. Breakfast. Transfer to the International airport for you flight back home. Note: Guarantee deposit for the rent of the car $750,00 with credit card. Does your dream vacation involve staying in a tropical environment surrounded by blue waters, packed with lush rain forests and adventure? Then Costa Rica might be the perfect destination for you. By booking an all-inclusive vacation package, you can enjoy everything without the hassle and headache of planning and purchasing each aspect of your trip separately. Transfer from Juan Santamaría International Airport to Presidente Hotel. A four-star, 100-room hotel in the heart of Downtown San José, Costa Rica, the Hotel Presidente is located on the corner of the Central Avenue Pedestrian Boulevard and Seventh Street, just 20 minutes from the San Jose, Costa Rica International Airport.(SJO). Overnight at Presidente Hotel. Pacuare River rafting: We will pick you up at your hotel and head through Costa Rica's colonial capital city of Cartago before rising up through the fertile countryside that surrounds the base of Turrialba Volcano. We'll stop for a delicious breakfast along the way. Once we arrive at the verdant banks of the Pacuare River, our professional guides will instruct you on paddling techniques and safety procedures before you don your helmets, grab you paddles and climb aboard the inflatable rafts for an unforgettable adventure. The Pacuare is a swift flowing river that offers visitors a unique and exciting rafting experience within one of Costa Rica's most unspoiled wilderness areas. In fact, expert rafters call the Pacuare one of the world's best white-water runs. Once in the river, you'll battle powerful rapids and rolling waves that spill over the sides of the raft drenching everyone with excitement and fun. Lunch on the way. Continue to Arenal area. Dinner. Overnight at Arenal Springs resort which offers spectacular views of the nightly showers of lava and glowing rocks discharged from the volcano, from the private balcony. After breakfast, free morning to enjoy the area. Lunch. In the afternoon visit to Tabacon Hot Springs where the hot springs flow from the veins of the splendorous and active Arenal Volcano. Enjoy this natural wonder of Costa Rica and soothing feeling in any of mineral pools and naturally warm waterfalls. Each thermo mineral water pool varies in temperature and depth, and some vary in mineral count. Buffet dinner at the resort. Overnight at Arenal Springs Resort. After enjoying breakfast you will be transferred to Langosta Beach. Lunch. Dinner. Overnight at Occidental Tamarindo all inclusive Hotel. Breakfast and free day to enjoy the beach. Lunch and dinner included. Overnight at Occidental Tamarindo hotel. Breakfast. Transfer to San Jose. Overnight at Presidente hotel. After breakfast transfer to the International airport to your flight back home. Tours: Pacuare River Rafting and entrance fee to Tabacon Hot Springs. Tortuguero National Park area is the most important nesting grounds for the Green Turtles in the Caribbean area. From July to September, thousands of turtles come ashore along these world-famous beaches to lay their eggs. Often called, "Costa Rica's Amazon", Tortuguero is a navigable network of lakes and channels that protects a great diversity of fauna and flora. It is possible to observe Iguanas, Monkeys, sloths, birds and much more..., discover the beautiful Puerto Viejo beach, explore the rain forest in the Caribbean Coast, walk and enjoy a trip to the jungle and be part of the experience to snorkeling in the Coral Reef, visit the active Arenal Volcano and visit Monteverde Cloud forest special for nature lovers. Tour to Tortuguero National Park. Typical breakfast included on the way and visit to a banana plantation. Boat transfer to your lodge. Lunch. In the afternoon visit to Tortuguero town and the small museum of the Caribbean Conservation Corporation. Dinner. Overnight at Evergreen Lodge. Boat ride to the National Park, hidden canals and lagoons around the park. Breakfast. Hiking guided tour in beautiful trails near your hotel. Lunch. Free afternoon. Dinner. Overnight at Evergreen Lodge. After breakfast boat and land transfer to Siquirres area. Box lunch. Transfer with the shuttle bus to Puerto Viejo beach. Overnight at Azania Bungalows. Designed and crafted in a unique style that blends traditional materials, exotic woods and thatched-palm roofs, with a modern building concept, each bungalow has a particular atmosphere. Breakfast. Snorkeling in Cahuita National Park. You will visit the many unique marine and terrestrial ecosystems of Cahuita National Park; its one of the most beautiful regions of the country. Its main attraction is a picture postcard reality of white sandy beaches, thousands of swaying palm trees, a calm sea of crystal-clear water and a live coral reef. In a glass fiber boat, plus Capitan and guide, you will be able to appreciate: 35 different coral species such as: You can practice the snorkeling for 2 or 3 hours, in different places of the most important Coral Reef of Costa Rica. After the snorkelling, the boat captain will take you to Cahuita Point. Right there, if you want, you can swim in the peaceful and warm water of the Caribbean Sea while you take a refreshment of tropical fruits. The tour includes lunch. Overnight at Azania bungalows. Pacuare river rafting. We'll stop for a delicious breakfast along the way. Once we arrive at the verdant banks of the Pacuare River, our professional guides will instruct you on paddling techniques and safety procedures before you don your helmets, grab you paddles and climb aboard the inflatable rafts for an unforgettable adventure. The Pacuare is a swift flowing river that offers visitors a unique and exciting rafting experience within one of Costa Rica's most unspoiled wilderness areas. 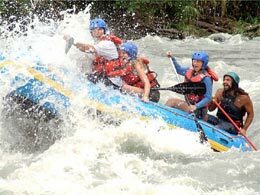 In fact, expert rafters call the Pacuare one of the world's best white-water runs. Once in the river, you'll battle powerful rapids and rolling waves that spill over the sides of the raft drenching everyone with excitement and fun. Lunch on the way. Continue to Arenal area. Dinner. Overnight at La Pradera Hotel. The hotel is located at the Arenal Volcano road, includes: Pool, Jacuzzi, Restaurant, 24 hour security, wireless internet and private parking. The cabins are bungalow style with cable TV, private bathroom, hot water, air conditioning, mini refrigerator and private terrace with panoramic view of the volcano. In the afternoon visit to Arenal Volcano National Park and Baldi Hot Springs, our hike takes you to the active side of the volcano where our naturalist guide will take you through rain forest trails for a nice and gentle hike where you can see a great diversity of flora and fauna and animals such as, monkeys, toucans, iguanas, plenty of birds and sometimes snakes. Once we arrive at the observation point we will be able to hear and feel the deep rumbling that proceeds occasional eruptions of steam, smoke and molten lava. At night if it is not to cloudy the show is even more incredible as the mammoth volcano spews red lava and huge rocks glowing against the black sky. While watching the volcano and taking pictures, our guide will share some information and history about the area and the volcano’s activity. Then we will continue our way down to the exotic and relaxing Hot Springs nearby, to sit back and relax in the volcanic water and sooth every aching muscle. Dinner. Overnight at La Pradera Hotel. Breakfast. In the morning, you will travel to Monteverde by land and boat transportation crossing the Arenal Lake. Monteverde is the Costa Rica's premier cloud forest. This 26,000-acre reserve is home to an astonishing diversity of plant and animal species. Overnight at Los Cipreses Hotel. Los Cipreses is a small hotel, located 5 minutes from the little town Santa Elena, in Monteverde, surrounded by beautiful gardens in a tranquil environment. This hotel offers friendly and personalized attention and comfortable rooms. Day 09: Monteverde/ Canopy tour and walkways. After breakfast, you will be taken to Selvatura walkways; this is a unique system of suspension bridges that zigzag through deep canyons at the level of the treetops and also enjoy the canopy tour adventure, then you will have free afternoon to enjoy other attractions of the area. Overnight at Los Cipreses Hotel. Breakfast. Free morning to enjoy the area. In the afternoon transfer with the shuttle bus to San Jose area. Overnight at KC Colaye hotel. Upon your arrival to the International Airport, our driver will pick you up and transfer you to Presidente hotel. A four-star, 100-room hotel in the heart of Downtown San José, Costa Rica, Presidente hotel is located on the corner of the Central Avenue Pedestrian Boulevard and Seventh Street, just 20 minutes from Costa Rica International Airport (SJO). Guests staying at the Hotel Presidente will be gratified by its ideal location, only a few blocks from the most important cultural and historical landmarks in Downtown San Jose: the Costa Rica National Theatre, the Gold -, Jade - and National Museums, the Asamblea Legislativa (Costa Rican Congress), the Plaza de La Cultura and Plaza de la Democracia and the National Cathedral. Overnight at Presidente Hotel. We will pick you up at your hotel, then we’ll stop for a delicious traditional Costa Rican breakfast along the way. Once we arrive at the verdant banks of the Pacuare River, our professional guides will instruct you on paddling techniques and safety procedures for an unforgettable adventure. The Pacuare is a swift flowing river that offers visitors a unique and exciting rafting experience within one of Costa Rica’s most unspoiled wilderness areas. Lunch on the way. Continue to Puerto Viejo in Limón. Overnight at Azania Bungalows. Designed and crafted in a unique style that blends traditional materials, exotic woods and thatched-palm roofs, with a modern building concept, each bungalow has a particular atmosphere. After breakfast, you will have free time to enjoy the area, we recommend you the snorkelling tour in Cahuita National Park (not included). Overnight at Azania bungalows. Breakfast. Transfer to Arenal Area. Late in the afternoon visit to Tabacón hot springs, where the hot springs flow from the veins of the splendorous and active Arenal Volcano. Enjoy this natural wonder of Costa Rica and soothing feeling in any of mineral pools and naturally warm waterfalls. Buffet dinner. Overnight at Arenal Volcano Inn. Arenal Volcano Inn is a new hotel which has 15 rooms with excellent view on the Arenal Volcano. The hotel has two swimming pools, one for adults and one for children, plus a Jacuzzi with temperate water. Breakfast and free day to enjoy the beach. Optional tours available: snorkeling tour, atv, kayaking tours, horseback riding (not included in the rate). Overnight at Tamarindo Diriá hotel. Breakfast and free day to enjoy the beach. Overnight at Tamarindo Diriá hotel. After enjoying breakfast, transfer to San Jose. Overnight at Presidente hotel. Upon your arrival to the International Airport, our driver will pick you up and transfer you to Presidente hotel. A four-star, 100-room hotel in the heart of Downtown San José. Overnight at Presidente hotel. Breakfast. Tour to Arenal volcano and Tabacon hot springs. 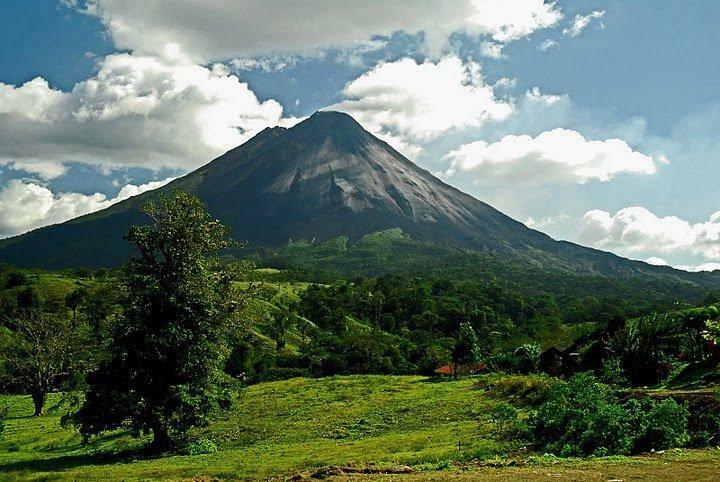 The Arenal Volcano is one of the most active volcanoes in the Americas. From our observation point, you will feel the ground tremble and see the night sky explode with ash and lava in a natural display of fireworks. Next, we will visit the hot springs of the volcano, where you can relax in the soothing waters and be caressed by the cool night air while observing the stars and the incredible night sky above the volcano. At a convenient time after your arrival, we will treat you to a splendid dinner. This is absolutely an evening you will not want to miss in Costa Rica! On this tour we will also visit the town of Sarchi, well known for the beauty of the handcrafts that they produce. The tour includes: Transportation, bilingual guide, lunch, entrance fee to Tabacón Hot Springs, buffet dinner. Overnight at Arenal Volcano Inn in a room with view to Arenal volcano. Breakfast. In the morning horseback riding to La Fortuna Waterfall, experience the breathtaking, naturally cool, La Fortuna waterfall. You will enjoy spectacular views of the lush environment of flora and fauna as you ride on horseback to this amazing 60 meter high waterfall. Upon reaching your destination you will trek through the rain forest to reach the waterfall where you can swim or just relax. Free afternoon to enjoy the area. Overnight at Arenal Volcano Inn. After breakfast you will be transferred to Quepos area. Overnight at Playa Espadilla Cabins, located 3 blocks from the beach and the entrance to the national park. Breakfast. Mangrove kayaking tour: Explore the wonderful world of mangroves just 15 minutes from Manuel Antonio area. Discover a variety of amazing wildlife within the mangrove forests. You will float under a lush canopy of rain forest, silently watching an spectacular variety of birds, snakes, crocodiles, ant eaters, and many groups of white face monkeys. The tour includes lunch or dinner and the pick up time depends on the tides. Overnight at Playa Espadilla Cabins. Breakfast. Free day to enjoy the are. We recomend you to visit the national park, where you can walk around the tropical forest and observe iguanas, birds, monkeys, etc. Overnight at Playa Espadilla Cabins. Tours: Arenal volcano and Tabacon Hot springs, horseback riding to La Fortuna Waterfall, mangrove kayaking, catamaran sunset sailing. Upon your arrival to the International Airport, our driver will pick you up and transfer you to Don Carlos hotel, a small cozy hotel located in San José downtown. Overnight at Don Carlos hotel. Breakfast. Pick the rental car up Daihatsu Bego 4x4 manual at your hotel and departure to Sarapiqui area. Selva Verde Lodge is a haven for nature enthusiasts, hikers, birders and general travellers. Nestled in the North-Central Lowlands of Costa Rica, Selva Verde’s private reserve protects over 500 acres of primary and secondary rain forest. Less than a 2 hour drive from San José and Arenal Volcano, Selva Verde is an ideal rain forest experience. Situated in the increasingly popular “green county” of Sarapiquí, the scenic drives to this region are in itself awe inspiring. Lunch and dinner included. Overnight at Selva Verde lodge. Breakfast. Free day to enjoy the area. Selva Verde lodge offers travellers and their families an authentic experience of the Costa Rica Rainforest. Choose from a wide variety of activities including hiking, birding and hands on learning about rain forest ecology. Explore the area with professional guides on foot and by water or spend time learning and working with the local community on projects that support the neigh boring area and environment. Discover wildlife, learn about environmental concerns, and meet local students and teachers. Lunch. Dinner. Overnight at Selva Verde Lodge. After breakfast departure to Arenal Area. In the evening visit to Tabacón hot springs where you can enjoy 11 thermal water pools. Buffet dinner at Tabacón. Overnight at Arenal Volcano Inn in a room with view to Arenal Volcano. Breakfast. Departure to Monteverde area. Monteverde is the Costa Rica's premier cloud forest. This 26,000-acre reserve is home to an astonishing diversity of plant and animal species. Overnight at Trapp Family Lodge, the closest lodge to the Monteverde Reserve Costa Rica, a 15 minute walk, great for bird watching. This cozy new 20-room inn pays tribute to its setting with beautiful tropical wood appointments, private balcony in each guest room, and a family-style restaurant fronted by huge picture windows and a balcony overlooking gardens and verdant rain forest. Set in a small private reserve, the lodge is ideal for families or anyone appreciative of a warm, home atmosphere and a convenient location just a few minutes walk from the Monteverde Cloud Forest Reserve. After a delicious early morning breakfast, you will be taken to Selvatura walkways; it’s an unforgettable experience, the excitement of looking to one side and seeing the tops of the trees and at the same time feel the sensation of walking among the clouds. Selvatura walkways is a unique system of suspension bridges that zigzag through deep canyons at the level of the treetops, then enjoy the adventure taking the zip line tour into the cloud forest. Free afternoon. Overnight at Trapp Family Lodge. Breakfast. Departure to Montezuma beach. The Montezuma area has beautiful beaches that you can often find almost deserted and some waterfalls hikes. Dinner. Overnight at Ylang Ylang resort. Located on 20 acres of white sand beach and set in lush tropical gardens is this hidden gem. A secluded romantic getaway for travelers who want a casual resort and love the sounds of the ocean! Imagine the beach just outside your bungalow... Sumptuous breakfasts and exotic candle-lit dinners... monkeys in the trees and coatis, agoutis and pacas roaming wild. Breakfast. Free day to enjoy the beach and the area. Dinner. Overnight at Ylang Ylang Resort. Breakfast. Free morning. In the afternoon departure to San Jose. Return the car at the hotel. Overnight at Don Carlos hotel. obtención de fibra y el proceso de teñido. restaurante típico de la zona.